First off, I need to thank everyone for their input on my last post. There were some really great suggestions, including one that has really started to evolve in my head... so we'll see where that goes! Well, I've been a busy bee, taking every opportunity that I can to get out there and strip it clean of the two layers of paint. After some stripping and then letting it dry out, B went at it with a random orbital sander and a belt sander to get rid of some of the leftover paint. 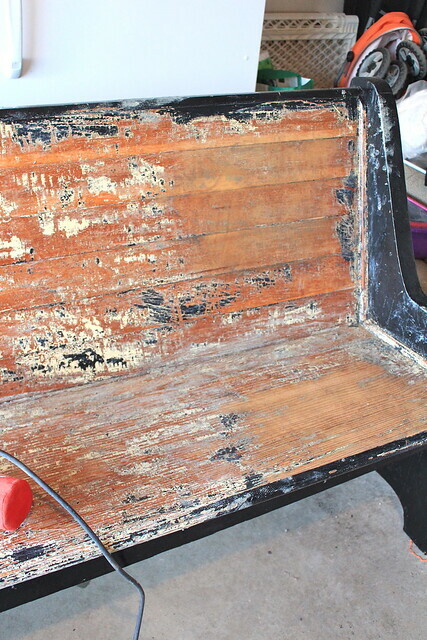 I am frustrated knowing that we could be in the refinishing stage already if we (read: I!) had just attempted sanding before stripping. 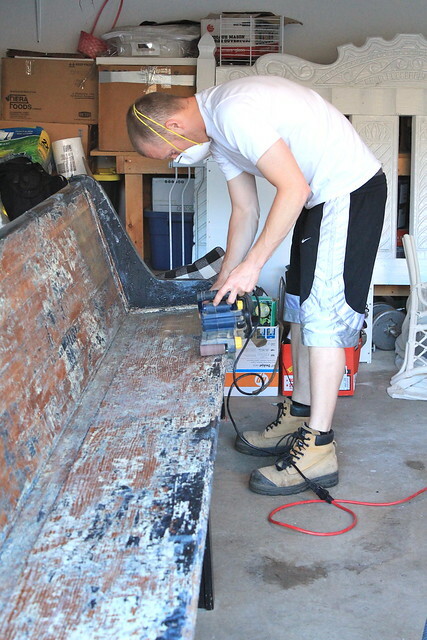 While sanding B also discovered that the back of our pretty pew is solid cedar - a very nice cedar, and he's intent on staining it. I on the other hand, am not completely convinced. After reading Jen's comment on my last post, I'm pretty sure I'd like to do something two toned (pulling colours from our end chairs at the dining table). 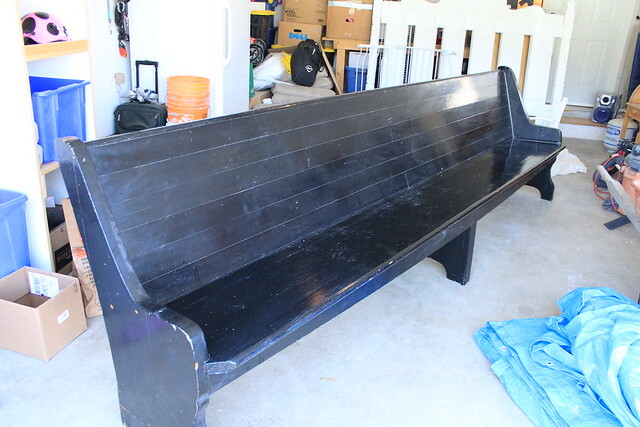 Something along the lines of this pew, or this one. B and I will continue to discuss this. So, with the progress we have made so far I am still hoping to have this project (as well as a few others I have started), completed before our house guests arrive later this month! I also believe that now that we've been in our West Coast home for over a year, I owe you some updated pictures of our spaces! Hope to start snapping some photos one space at a time once I get them cleaned up. 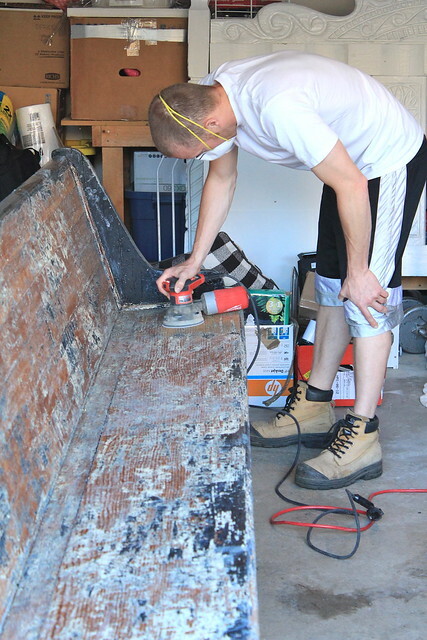 Have you been working on any projects recently that seem never ending? Maybe you've had a frustrating experience with something you are trying to tackle? Well... it's been far too long since I've been around these parts. I've just been busy being a Mom, keeping home, doing fun things with the family and small projects around the house. Nothing has really given me that spark recently to write... even when B began building Halle's playhouse in the backyard, or started working on tiered vegetable garden (all of which there will be photos of.... soon). 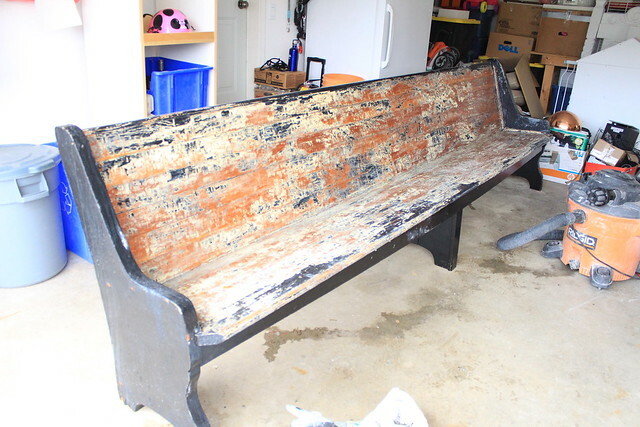 Then, the other week, I was doing my usual craiglist creep when I struck gold! I've made some more progress since this photo was taken, but I still have a lot left to do. 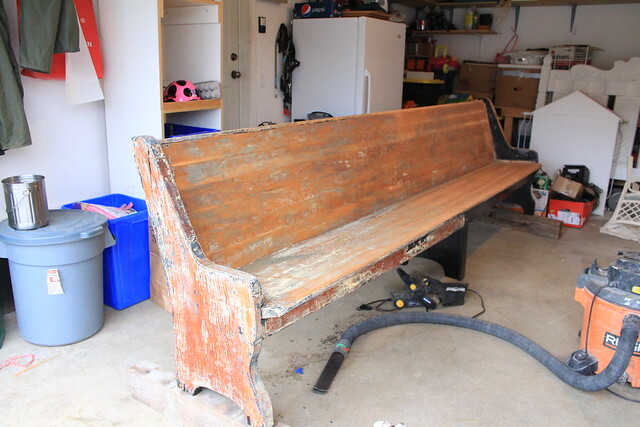 The wood seems to be in okay condition, but I'm not sure I want to stain it. 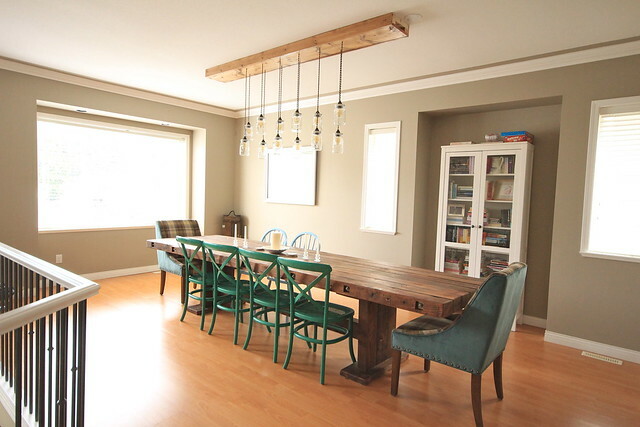 Even if we use the same stain as we used on the table and light fixture, it would come out a different colour (just like the table and light fixture did). I'm concerned that it will be too many types of woods and tones competing in the space (especially since we also have our wine rack and a new little wood table that I scored at the Salvation Army. So, I guess I'm looking for a little input. 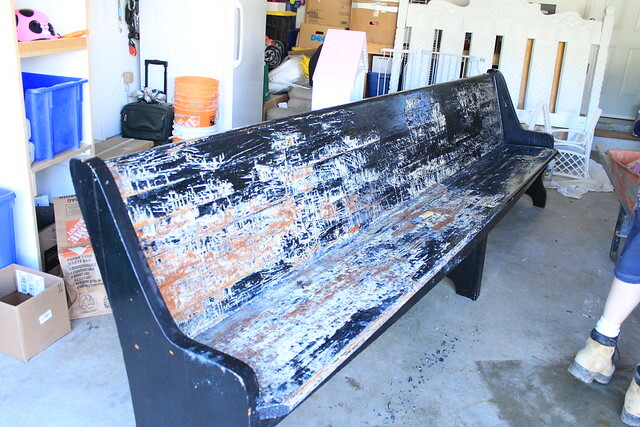 While I strip and sand this big old pew down, I want to know - What would you do? What do you think I should do? Stain it? Paint it? I'm thinking maybe a cream colour, similar to the light part of the plaid on our head chairs at the table. 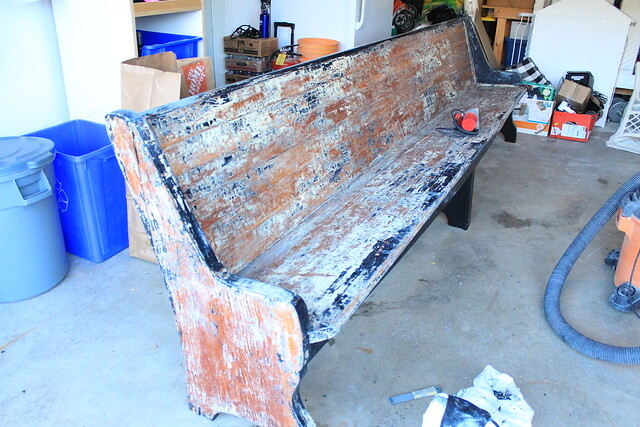 At this point, I'm leaning towards painting (which would save me a lot of stripping down the line)... so give it to me! What should I do?